This articles focuses on the dolly preparation process and its importance in maximizing repeatability by ensuring a strong bond at the dolly-adhesive interface. Portable pull-off adhesion testers measure the force required to pull a specified diameter of coating away from its substrate. This measured pull-off force provides a direct indication of the strength of adhesion between the coating and the substrate. By eliminating sources of pull-off variation, such as unintended bond failures between the adhesive and poorly prepared dollies, adhesion test results become even more meaningful and predictable. The major components of a pull-off adhesion tester are a pressure source, a pressure gage and an actuator. During operation, the flat face of a pull stub (dolly) is adhered to the coating to be evaluated. After allowing for the bonding adhesive to cure, a coupling connector from the actuator is attached to the dolly. 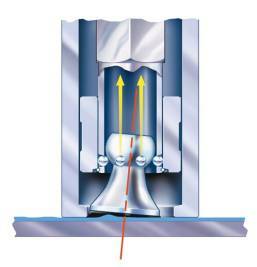 By activating the pressure source, pressure is slowly increased to the actuator within the system. When the pressure in the actuator becomes larger than the bond strength between the coating and the substrate, separation occurs and the actuator-dolly assembly lifts the coating from the substrate (refer to Figure 1). The maximum pressure indicator of the system’s pressure gauge provides a direct reading of the pressure at which the pull-off occurred. For further details on the theory and requirements of pull-off testing please refer to the two most applicable international standards, ISO 4624 “Paints and Varnishes – Pull off-test for adhesion” and ASTM D 4541 “Standard Test Method for Pull-Off Strength of Coatings Using Portable Adhesion Testers”. Dollies for pull-off adhesion testers are constructed of a wide variety of metals including aluminum, carbon steel and stainless steel. Though tests performed within this study focused on the disposable aluminum dollies used with the DeFelsko PosiTest pull-off adhesion tester identified in the proposed Annex A5 of ASTM D 4541 (refer to Figure 2), the principles discussed apply to all dolly types. Dolly preparation typically consists of three important steps: degreasing, abrasion and cleaning. Degreasing refers to the removal of any trace oils or grease from the surface to be bonded. This may include oils from the skin of the person handling the dolly. Abrasion is an aggressive alteration of the profile of the dolly surface. Abrasion serves two primary purposes: to increase the available surface area for bonding, and to remove any oxidation or rust. Cleaning is simply the removal of any loose particles from the surface to be bonded, particularly those created by abrasion. Some dolly types are machined prior to shipping which alleviates the customer’s need for degreasing the dollies since the machining process and subsequent care in handling and packaging removes any contamination. Typically, the manufacturer provides applicable equipment, materials and instructions to the customer to facilitate any preparation prior to adhering dollies. Manufacturer recommended preparation methods should be based on extensive lab testing of abrasion and cleaning methods for their dollies. Preparation methods should also be clear, simple and detailed enough to ensure repeatable results between operators and applications. A detailed experiment was developed to verify and summarize the results of tests and comparisons previously conducted during the product validation design phase. The experiment’s purpose was to directly measure the effects of oxidation and dolly preparation (degreasing, abrasion and cleaning) on adhesion. The test method involved randomly adhering 48 aluminum test dollies to a coated carbon steel plate with a suitable adhesive selected during other testing. As the intent of the study was to evaluate factors affecting the bond strength between the adhesive and the dolly, an attempt was made to develop a substrate and coating combination with an extremely strong adhesive and cohesive bond that would also bond well to the previously selected Araldite 2011 adhesive. To attain this, a 4 mil coating of the same Araldite 2011 was baked onto a ¼” thick carbon steel plate taken from a ship’s hull. The steel plate was carefully prepared by grinding away several mils of potential surface corrosion and contamination, then cleaning with alcohol and a dry cloth. The result was a coated substrate with a sufficient bond strength to prevent any unintended coating failures during the 48 pull-off tests. The test dollies were equally split by abrasion method, oxidation period, cleaning method and adhesive cure time. The four methods of dolly abrasion included machine flattening, end milling, fine grit sandpapering, and rubbing on a Scotch-Brite pad. Each group of abraded dollies was left exposed to air for three different time intervals prior to application (7 days, 24 hours and a few minutes). Prior to adhering to the coating, the dollies were either wiped with a dry cloth, or cleaned with an alcohol dipped cotton swab and then wiped with a dry cloth. The net result was two samples prepared using each possible combination of methods. A sample from each of these pairs was then allowed to cure for either 24 hours or 5 days prior to pull testing. Results were tabulated by each factor and the average results by abrasion method for each set of 12 dollies are listed in Table 1. As expected the critical factor for preparation was the method of abrasion. When comparing the results to the method of abrasion for the dolly a predictable pattern emerges. The weakest bonds were the machined only and end milled dollies. These dollies experienced a near 100% adhesive to dolly bond failure. This was expected since both preparation methods result in surfaces that are relatively smooth, though the end mill process places large visible grooves into the dolly surface. These grooves increase the surface area of the dolly, likely accounting for the slightly higher bond strength demonstrated prior to failure. As found in previous tests, the Scotch-Brite pad achieved the highest overall bond strength, with the sandpaper second. Though the visual abrasion results with a Scotch-Brite pad and sandpaper are similar, it is likely that the microstructure (surface profile) from using a three dimensional abrasive conditioning pad such as Scotch-Brite is more conducive to adhesion. For adhesion to occur, it is necessary that some form of capillary reaction draw the adhesive into the microstructure, thus minor changes due to grit or method of abrasion may have significant impacts. Another interesting result was significantly higher variation between pull-offs for sandpaper versus Scotch-Brite. This result could be related to the rapid build up of aluminum that was observed on the surface of the sandpaper, which is difficult to clean between applications. As a result, not every dolly is likely to receive the same microstructure. The Scotch-Brite pad allows the aluminum dust to fall through its fabric, which appears to give a more repeatable microstructure. The Scotch-Brite pad also wears at a slower rate requiring less frequent replacement. The average adhesive bond failure based on oxidation time following abrasion is shown in Table 2. This relatively minor difference in bond strength is likely due to a limited impact of oxidation on the aluminum dollies. Since aluminum typically produces a thin aluminum oxide layer immediately upon exposure to air, it is reasonable that uncontaminated dollies would not experience long-term exposure effects. The impact of oxidation would potentially be much more significant for other dolly material types, particularly carbon steel. The average adhesive bond failure based on cleaning method prior to bonding is shown in Table 3. This negligible difference further supports the theory that the pre-shipment machining of dollies eliminates any potential need for degreasing dollies before use, aso long as they are carefully handled by the customer. It is important to note that the development of hypotheses, and the selection and elimination of factors was based on several previous tests, comparisons and experiments. Some of the eliminated factors with related test results are briefly outlined below. It is commonly accepted that aluminum that has been anodized by the chromic or sulfuric acid methods and sealed, may be bonded after degreasing and light abrasion. Phosphoric acid anodized aluminum has the optimum surface properties for bonding directly without pretreatment, but the treated dollies must also be bonded within a few hours of anodizing for the desired effect. Ž This theory was tested with a small sample of dollies that were adhered approximately one week after anodizing. The delay in adhering the dollies was largely due to unavoidable shipping and handling times. These dollies were also tested against end milled dollies. The anodized dollies had 20 to 30% lower bond strengths. A test was performed using an aluminum surface primer in an attempt to maximize the dolly adhesive bond. The surface primer tested was Henkel Alodine 1132 which came highly recommended as a military accepted conversion coating. The test used an equal number of dollies of different abrasion methods including machining, end milling, sandpapering and shot blasting. In addition, 6 different two part epoxies were used. The net result was an average adhesive failure bond strength of 1776 psi with the Henkel versus 2277 psi without. This result is likely attributable to a combination of factors, foremost being that while the Henkel product, while a highly accepted bonding agent, does not necessarily have the tensile strength required for use in pull-off adhesion testing. It should be noted that the Henkel product did improve pull-off test strengths for some combinations of adhesives and abrasion methods, but overall resulted in lower readings. A final notable comparison involved the degreasing and cleaning of dollies. To briefly summarize, dollies that had been abraded and carefully handled didn’t require any special degreasing and cleaning methods. Whether dollies were swabbed with methyl ethyl keytone, acetone or alcohol, or more simply wiped with a dry cloth, variations in bond failure strengths were not statistically significant. Dollies that were abraded and then directly applied without cleaning or degreasing, resulted in lower average bond failure strengths at the dolly-adhesive interface. When studied under the microscope, the adhesive that remained on the coating from these failures tended to have a higher visible concentration of contaminants on its surface (particularly from abrasion methods such as sanding), when lower bond failure strengths were noted. These preliminary results, combined with the prohibitive costs of adding processes such as shot blasting, anodizing, conversion coating and degreasing led to the development of a simple, yet refined process, that is more conducive to field implementation by the customer. A common customer inquiry directly relating to dolly preparation is the reuse of disposable dollies. This desire typically comes from customers accustomed to adhesion testers that utilize the more expensive steel dollies. Such applications offer customized equipment that enables the customer to remove coating and adhesive from the dolly by heating and time consuming scraping. The number of times the dolly may be reused is typically only limited by the effects of abrasion on the dolly surface before each reuse. Based on discussions with numerous inspectors, they often disregard the notion of reusing dollies due to their inherent need to maintain the dollies as critical evidence of test results. Other customers choose to retain dollies as permanent quality records that demonstrate the success of the pull off, while also providing related details such as the thickness of the coating pulled. One approach to eliminate the reuse of dollies is the provision of a more affordable disposable dolly that the customer may choose to save or dispose of after testing. If the dolly can be returned to its original condition, there is little foreseeable harm in reusing. It is cautioned however that if significant damage or wear occurs on the dolly then reuse is strongly discouraged. This is more common and immediate with aluminum dollies that are subject to marking by the quick coupling during high pressure pull-offs. All dolly surfaces may be subject to uneven surfaces due to repetitive sanding or machining while cleaning previous test coatings and adhesives. The experiments, tests and comparisons documented throughout this article demonstrate the need for manufacturers to provide the necessary equipment and methods to properly prepare dollies for repeatable pull-off testing. While recognizing that there are unlimited chemical and mechanical solutions to preparing dollies, it is suggested that more simple and affordable methods of abrading dollies may exist. In the case of the particular aluminum dollies studied, abrasion with a Scotch-Brite pad followed by cleaning with a dry cloth was more than sufficient to eliminate bad pull-off tests due to adhesive-dolly failures. Experimental results briefly mentioned in the article also demonstrate that different material and adhesive combinations might have their own optimal preparation methods. Experiments showed that changes in the abrasion method increased the bond strength for one type of adhesive while lowering it for another. Not all of these alternatives were fully explored, since their preliminary bond failure strengths were still significantly lower for a particular adhesive and its related dolly preparation process. Since factors such as coating compatibility and cure time may limit the use of a particular adhesive for an applications, it is recommended that the factors discussed in this article be used to provide a framework for selecting and verifying customer made changes to the manufacturer’s recommended dolly preparation method. DeFelsko would like to thank Mike Munsell, a design Engineer at Vantico, for supplying invaluable technical assistance, as well as Bill Corbett and KTA-Tator for providing samples and sharing field experience during the PosiTest’s test phase.